Spain's monarchy was restored in 1975 following 44 years of vacancy under the 2nd Spanish Republic and Francoist Spain. 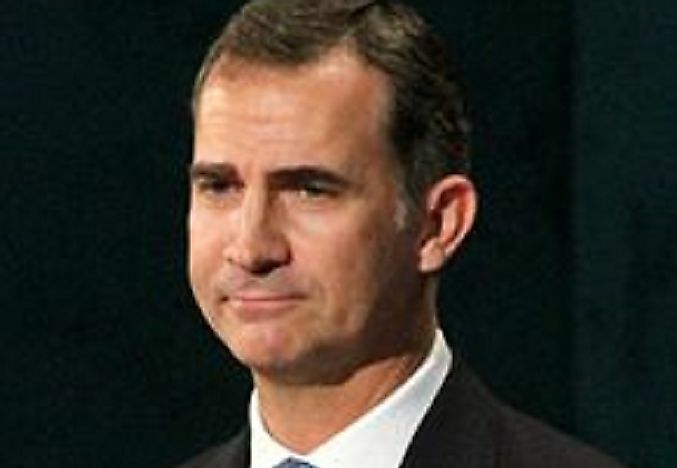 Felipe VI became King of Spain in 2014. Spain is a country found in the southwestern region of Europe, and also possesses archipelagos in the Atlantic Ocean and the Mediterranean Sea. The capital and the largest city is Madrid located in the central regions of the country. The Spaniards are the predominant ethnic group, accounting for 90% of the population, while other groups make the remaining 10%. It is a unitary parliamentary state led by a monarch and a Prime Minister and use Spanish as the official and national language. The incumbent prime minister is Mariano Rajoy, and the monarch leader is Felipe VI. The monarchy of Spain is constitutionally known as the Crown and is a constitutional institution and an important office of the country. The Spanish monarch consists of the monarch, his or her family, and the royal household of the organization which supports the king in the exercise of his royal duties. The First Spanish Republic in the 1870s. The First Spanish Republic in the 1870s was a political regime that existed in the country between early in 1873 until late in 1874. The Constituent Cortes (bicameral parliament) was called upon to write a federal constitution where the radicals preferred a unitary republic. The radicals had initially been driven out of the power by the revolution of 1868.The first Republican attempt to power was characterized by immense political ad social instability and violence. The republics founding started with the abdication as king of Amadeo I after the Hidalgo affair where he had been required by the radical government to sign a decree against the artillery officers. Four distinct presidents governed the first Republic that lasted for even months. It was overthrown via a coup led by Manuel Pavia and a unified republic led by Francisco Serrano was established. A coup by Martinez-Campos ended the first Spanish Republic and restored the monarchy under Alfonso XII which was commonly referred as the Bourbon restoration. After almost an entire century of war and political instability, there was a need to create a new political system, and hence came the restoration of the monarchy. There was a deliberate rotation of the liberal and conservative parties in the government in such a way that no sector felt isolated. The other parties such as the socialists, republicans, anarchists, nationalists, and Carlists were excluded from the government and opposed the system. The constitution in 1876 established Spain as a constitutional monarchy and gave the monarch immense powers. He could name senators and revoke laws, and he was also made the commander of the Army. The reign of Alfonso XII was marked with economic prosperity and modernization of the nation. In 1923, the monarch suspended the constitution to give himself absolute powers and become a dictator. In 1930, the Socialists and Republicans were enjoying increased support, while approval of the monarch was rapidly dwindling. Street riots and protests were held advocating for the removal of the king. Anti-monarchist candidates won the majority of votes in municipal elections. The last straw was when the Army declared that it would not defend the king and he fled Spain paving way the second Spanish Republic. The republican government went into exile in 1939 after the Spanish civil war fought between the Republicans and the Nationalists lead by General Francisco Franco who then ruled Spain for 36 years. In 1947, Franco made Spain a kingdom again, and he became the head of state of the Kingdom through the law of succession. In 1975, General Franco appointed Juan Carlos as his successor. Carlos presided over Spain's transition from dictatorship to democracy by endorsing political reforms. Juan Carlos worked towards establishing reliable political customs and professionalizing and building a nonpartisan and independent Monarchy. The king is the head of the country as well as a symbol of unity for Spain. He also sanctions and promulgates laws and can also call for a referendum in cases provided for by law. He is the commander of the armed forces and on the president of the government’s proposal, appoints and dismisses members of the government. Juan Carlos I ruled Spain following the death of General Franco from 1975 until 2014. Carlos introduced political reforms which saw Spain transit into democracy. He was born to Infante Juan who was the designated heir of King Alfonso XIII. The early lie of Juan Carlos was shaped by political concerns of Franco and his father. In 2012, he was criticized for making an elephant-hunting trip to Ghana in the middle of Spanish economic crisis and high unemployment. He later apologized. He is an amateur radio operator, a sailor and hunts bears for fun. Felipe VI is the current reigning king of Spain. He was born in 1968, and formally crowned as a prince in 1977. He was enrolled in a military training school in 185 to prepare him to be the King and is even trained as a military helicopter pilot. He has ten godchildren, and is married to Leizia Ortiz Rocasolano.